Having already solidified herself as a queen on earth, Beyoncé is expanding her reign to the fictional realm of Disney. Yes, Queen Bey has been confirmed as the voice of Nala in the upcoming live action remake of The Lion King. Rumours about Bey's potential role in the upcoming Jon Favreau-directed film have been swirling since March of this year, and it looks like all involved finally got their wish. Bey will get top billing in the cast, alongside Donald Glover, who will voice the titular role of Simba — both the rightful king of Pride Rock and Nala's childhood sweetheart. 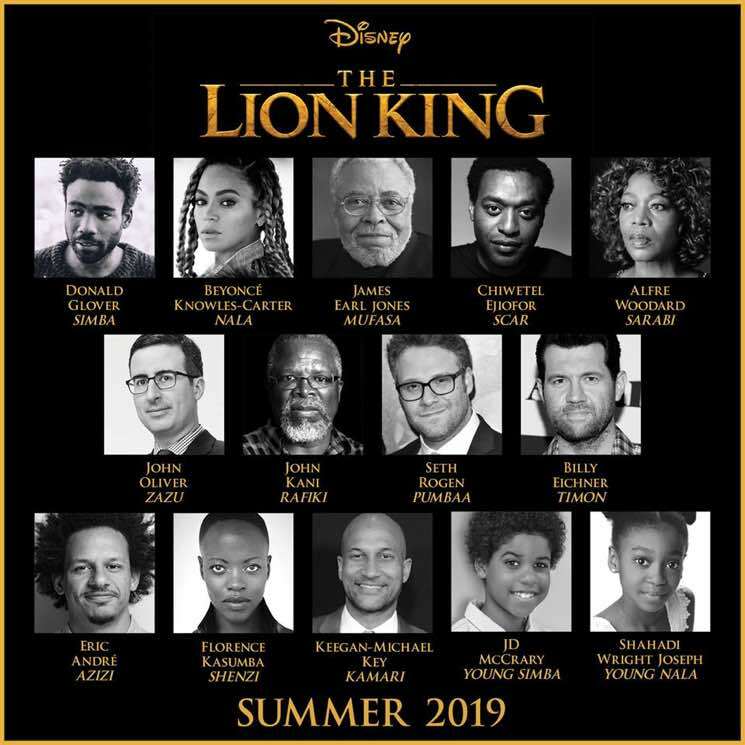 Other notable names that have joined the cast include James Earl Jones (reprising his original role as Mufasa), Chiwetel Ejiofor (as Scar), John Oliver (as Zazu), Eric André (as Azizi) and Keegan Michael Key (as Kamari). Seth Rogen and Billy Eichner were previously tapped to play the comedic duo of Timon and Pumbaa. See the full list of announced cast members below. The Lion King live action remake is set to arrive in theatres in 2019. It marks Favreau's Disney live action follow-up to 2016's The Jungle Book. Other recent Disney live action remakes include Alice in Wonderland (2010), Maleficent (2014), Cinderella (2015) and Beauty and the Beast (2017).